Wheat and oats are finally being combined around the Cuba City area. Yields have been good, and moisture seems to finally be dry. Straw quality has also been good, due mostly to our dry stretch that we are going through. Corn and bean crops both look good considering we haven’t had a significant rain event in three weeks. Some of the lighter soil fields are starting to fire up the stalk from a lack of moisture. This week shows a few chances of precipitation that hopefully makes it to us. 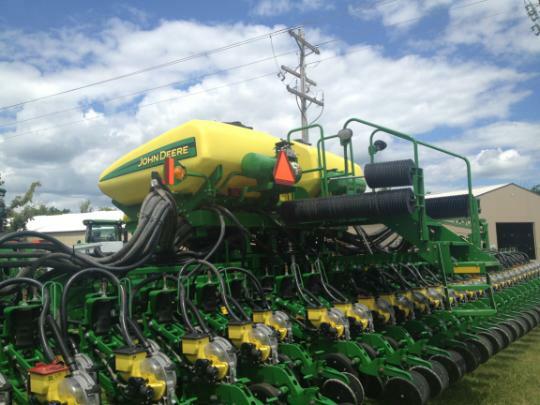 Stine Seed Company and John Deere have announced that they will be working together to build a planter that is capable of planting ultra-narrow rows. 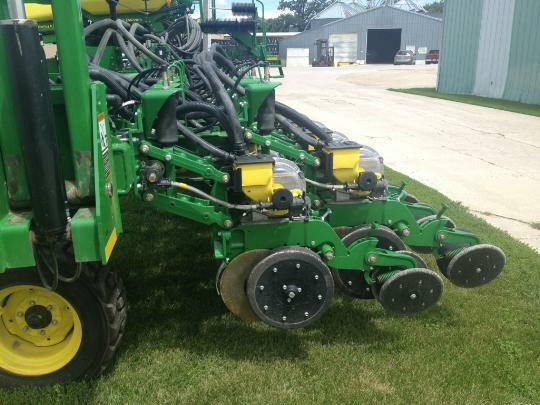 The planters are DB60 72 row and also a DB40 48 row that is set up on 20” twin rows with 12” in-between pairs and 8” within the pair. The partners decided to the use the twin 20” method to utilize factory available equipment and get away from expensive customized planters and corn heads. Stine Seed Company is only requiring a small amount of seed to be purchased, along with a small upfront amount of money for the first year’s use of the planter. If the producer feels that the ultra-narrow rows are not worth the investment they can walk away from the program. 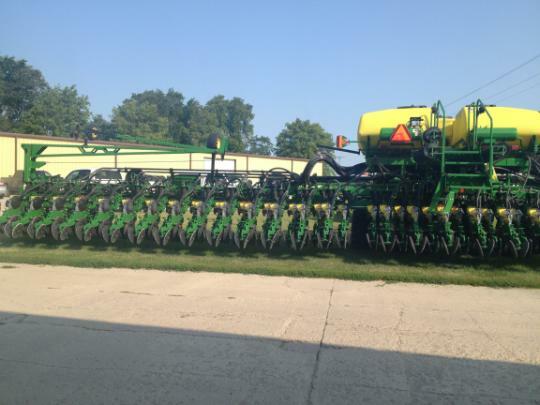 If the producers opt to stay in the program for the second year they can purchase the planter for only a little more money. It is clear that Stine Seed Company is confident that their seed along with John Deere’s planter is the key to higher yields. With this arrangement, it is very exciting to be involved on the cutting edge of this technology. Along with a few of the other stores, Cuba City and Bloomington have been actively demonstrating the W235 windrower. Customers have been very impressed with the power and speed of the mower. The new W235 has 235 H.P. with up to 255 H.P. during the power bulge. It also has a huge 44% torque increase. Usually higher horsepower engines seem to be less fuel efficient, but this hasn’t been the case with the W235. During our demo’s we had two customers ask if the fuel gauge was broken! They couldn’t believe that it was cutting hay at a faster speed and using less fuel than their current windrower. Crop dry down has also been compared to the customer’s current windrowers, and for the most part the W235 with a 995 and Tri-lobe rolls seems to be very similar. Customers have also commented on finally having a true centered cab that is both quiet and spacious. In addition to the better cab, the W235 has integrated auto-trac that works great at a high rate of speed especially when utilizing the new Sloan Implement RTK network in Southwest Wisconsin.